Foundations of drawing are a big part of becoming a success at painting and other mediums. Even if you’ve never drawn a thing – you can learn! It’s a matter of training your eye to see things as an artist does, and then translate that to paper. As you learn about Form – Shapes – you’ll begin to discover them in objects all around you every day – even in objects you hadn’t considered to be made up of basic forms. Once you begin to grasp the concepts of Depth in the Perspective lessons, you’ll find yourself analyzing your friends’ photos on Facebook to find vanishing points! (Just keep it to yourself, you don’t want them to think you’re an art nerd!) And in the Volume section of class, five images will be explored to see the light and shadows that give them mass. 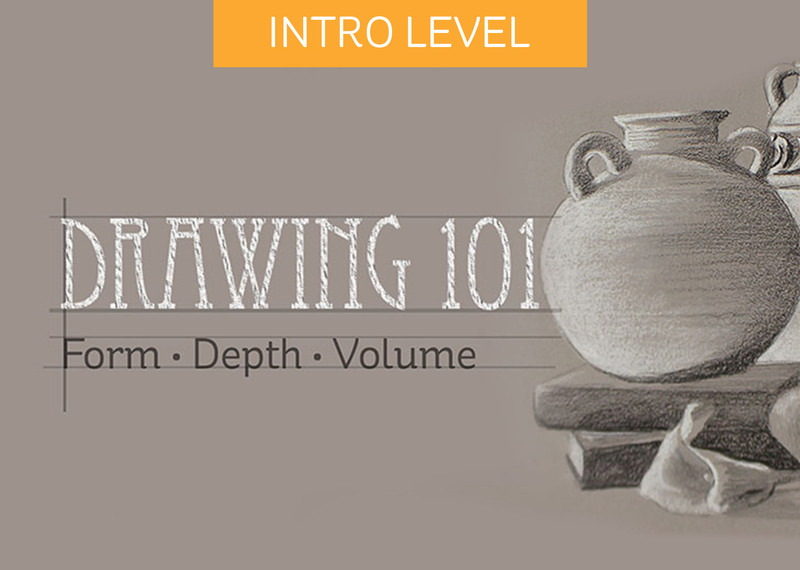 This course challenges and stretches beginning drawing skills. Sandy’s teaching style is encouraging and equipping, her clear examples and directions help me to be successful even when I do not believe I can complete a lesson. Sandy takes her students through a logical sequence of skill building and encourages practice. I found the content quite challenging because I was told that I did not have drawing skills, however having taken several of Sandy’s courses I trusted her to teach me and I am so glad that I did. I never thought I could draw. This course woke up a drawing part in me that had been asleep for decades! From basic shapes, perspective, and from simple spheres to tall buildings, this course will take you from beginner to drawing realistic buildings and scenes. It helped me find courage to try and then achieve. Thank you, Sandy!! !